Wales & West Housing has secured £839,000 of Welsh Government innovation funding towards the cost of a Bridgend pilot scheme to build homes capable of generating their own energy. Work is due to start on 14 new homes on land to the west of Bryn Bragl, Bridgend, early next year and is expected to take 12 months to complete. The development is the first housing scheme in Wales to follow the design of the innovative Solcer House at Stormy Down near Bridgend, which was designed and built by the Welsh School of Architecture at Cardiff University. Work on the scheme of one bedroom apartments and two and four bedroom houses is expected to start later this year. The Solcer House was Wales’ first low cost energy positive house to generate more heat and electricity than it uses over a year. Like the Solcer House, the new WWH homes will incorporate the latest energy efficient and renewable technologies. It is expected that residents moving into the new homes could see a 90 per cent drop in their household bills as the homes should generate more electricity than they actually use. 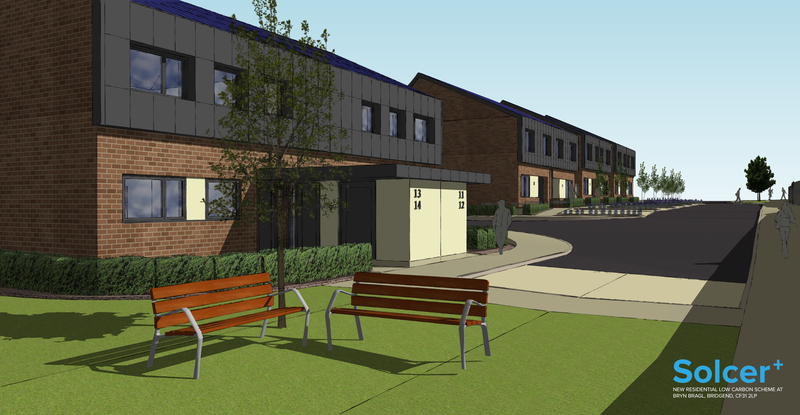 The Bryn Bragl scheme is one of 10 projects in Wales sharing £43million in the second phase of the Welsh Government’s three-year Innovative Housing Programme. The grant of £839,000 brings the total of Welsh Government investment in the scheme to £2.1 million with a further £1 million of Wales & West Housing investment.